Modern one bedroom self catering serviced apartment in the Surrey town of Camberley. 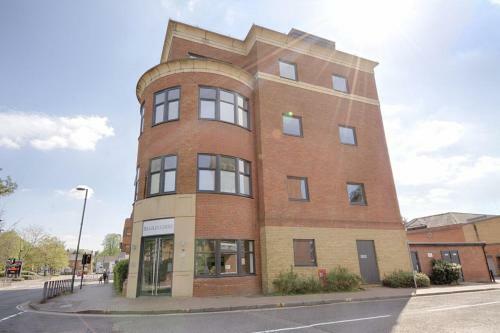 Located in a very good central Camberley position, Bradley Court apartment has a contemporary stylish decor. The apartment offers a comfortable open plan lounge with seating and dining table leading to a well equipped kitchen where you'll find appliances including an oven, microwave and washer/dryer. Patio doors in the lounge open up to a spacious outside terrace with seating. A stylish bathroom as twin sinks, a WC and a walk in shower. The apartment has free wifi for guests to use. Serviced studio apartments for up to two people at Central House in Camberley town centre. 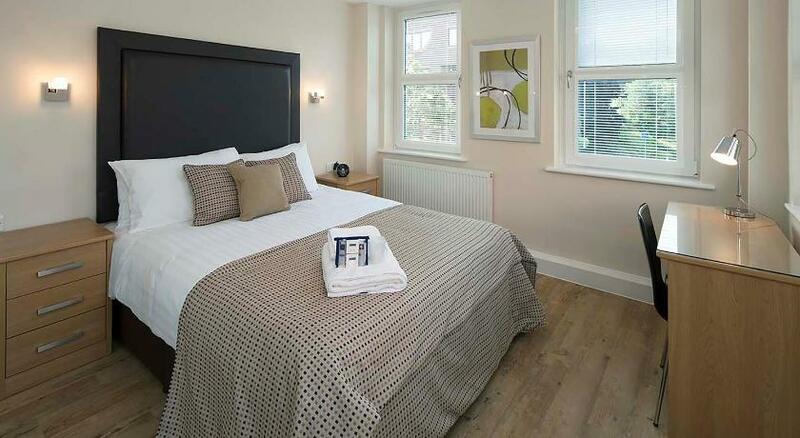 Modern, luxury four star serviced apartments in the heart of Camberley, Surrey. Camberley is an attractive Surrey town which is rightly proud of its links to the Army. The town centre has an excellent range of shops and a theatre. Whether you're visiting Camberley on business or pleasure, a serviced apartment represents an excellent alternative to a conventional hotel, providing convenient, private accommodation. We have listed some of the serviced apartment options available, including the highly-rated Bradley Court apartment in Knoll Road, accommodation from from Flexi-lets in Southwell Park Road and Central House apartments in Park Street. Shopping centre in Camberley with stores such as House of Fraser, Argos, Boots, Costa, Lloyds Bank and Jones Bootmakers. Sandhurst at Camberley is the British Army's initial officer training centre. Camberley Theatre celebrated its 50th anniversary in 2016. The venue hosts a range of performances and events throughout the year as well as a Christmas panto. Camberley Theatre also has conference facilities and a Cafe/Bar. Camberley Railway Station has been in use since 1878 and sits on the Ascot to Guildford line with regular trains operating between those locations. Bustling Surrey town with good selection of shops and restaurants, and the Lightbox museum and gallery. Developed as a New Town after WWII and home to many international businesses.